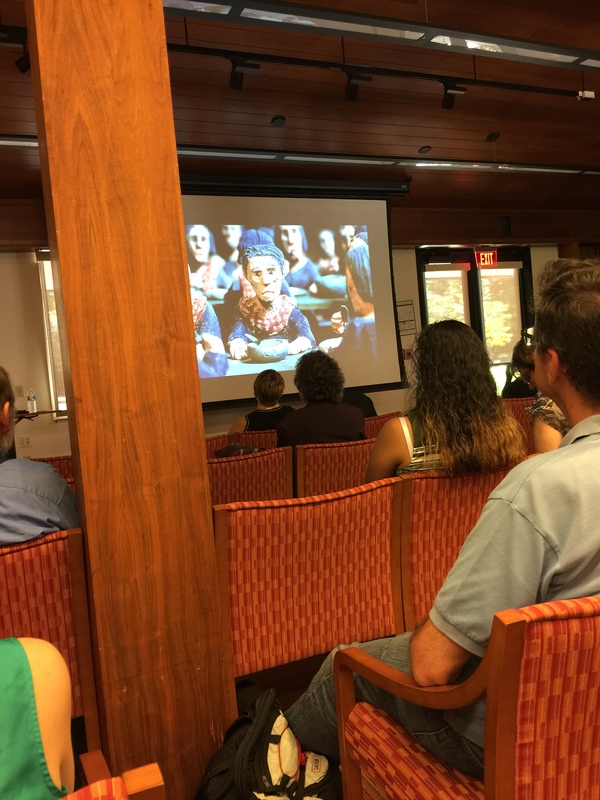 From June 4-6, 2015, I participated in the Soul Wounds: Trauma and Healing across Generations conference at Stanford. The Research Group on Collective Trauma and Healing brought together an interdisciplinary group of scholars, practitioners, and activists to study traumatic injury and its multi-generational legacies. The conference was an intense but thrilling event. I arrived late Thursday afternoon, after the conference convened, so I missed the first sessions and plenary talks. But I managed to catch an excellent panel. Ling Lam’s “Through the Eyes of a Child” was especially helpful for understanding the intergenerational transmission of trauma and Monique LeSarre’s work on the connections between historical trauma and people within the carceral state were excellent for helping me to think through the transmission of trauma and what people might need if they are going to heal. The evening was capped off by Michael Skinner’s keynote on Epigenetic Transgenerational Inheritance, which means I have to move work by Dorothy Roberts and Ruha Benjamin closer to the top of the stack of books I have to read to understand the ways traumatic injuries show up in later generations. There were three sessions running concurrently which resulted in a lot of people hopping between one session or another. I started in the session on Trauma and Healing in Indigenous Groups, so I heard Amy Lonetree‘s excellent paper on the devastating psychological wounds connected to the state of Missouri’s removal of indigenous child from the homes of their parents. Stephanie Gilbert’s paper on the racist logic behind Australia’s removal of aboriginal children from their parents and heartbreaking fallout revealed the global nature of the white supremacist project of removing children of color from their parents (this also happened in the U.S. after slavery). Gilbert asked a great question that never got answered: how do you construct an identity amid the “stolen bodies and severed connectedness” that comes with the wounds of child removal? I went to Creative Approaches to Trauma and Healing to hear Alexander Eastman’s “The Triunvirato Cemetery”: Diaspora, Grief, and Curative Powers of Remembrance, a paper that covered Cuban black radical activists’ efforts to assert a black identity and commemorate slavery. The day was broken up with two outstanding plenary talks. Angelika Bammer, in “The Work of Memory and the Wounds of History,” asked difficult questions about commemorating atrocities. She noted that a lot of memorials, in their very construction, do the work of memory for visitors, giving them superficial and often singular ways of experiencing/understanding a wounding event. She then showed us “counter-memorials,” like Stih and Shnock’s Bus Stop and Places of Remembrance, which require visitors to do the emotional work themselves. At the center of this work is “giving time to the dead,” which provides a much more personal experience of atrocities and makes them harder to forget. This image from the documentary “The Missing Picture” shows another example of a counter-memorial. Film maker Rithy Panh, a survivor of Cambodia’s killing fields created clay figures of victims of to work through what happened to his family under the Khmer Rouge. Lyra Monteiro, in “We Are Trauma’s Children,” discussed a number of things regarding collective identity and remembrance of slavery but one of the more memorable topics was her role in ‘A Thousand Ships’ an event marking the bicentennial of the legal end of the Trans Atlantic Slave Trade. You can read more about it here too. I spent most of the afternoon in Religion, Spirituality, and Soul, with Maria E. Hamilton Abegunde‘s “‘The Ariran’s Last Life’: When the Dead Tell Their Own Stories.” You can read more about her work here. I also heard Indhira Udofia‘s riveting “‘Mending the Wounds of a Bruised Body’: An Ecclesiastical Framework for Healing LGBTQI Individuals in the Black Church.” I loved that she covered the challenges Black LGBTQI people have in walking away from the spiritual community they find in African American churches, despite many churches’ rejection of them. I dipped out to hear Thom Allena‘s “Transforming the Wounds of Traumatic Legacy: Engaging the Soul of a Place.” With my dipping and diving, I missed Jacqulyn Hamilton’s “‘Coming Home, Bringing Me Back to Myself’: Black Message Therapists as Social Justice Workers,” but having talked to her, I’m sure her presentation was excellent! I presented my paper, “‘They Broke Something in Me'” at the Truth-Telling and the (De-)Construction of National Narratives session. In an experiment with making some of my work-in-progress available, I added audio to my slideshow, uploaded it to YouTube, and voila! I’ll invest in a better mic and then I should be set. I was joined by Cyril Adams, whose paper was titled, “Exploring the Salience of Intergenerational Trauma in Post-Apartheid South Africa.” Cyril and his collaborators interviewed the children of apartheid on the ways the violence they and their families endured stuck with them and their feelings about the Truth and Reconciliation Commission. In “Investigating a Kinship Lynching,” Karen Branan presented findings from her research on her family’s role in a lynching. Her book, The Family Tree: A Kinship Lynching in Jim Crow Georgia, will be out soon. The afternoon session consisted of workshops. I went to History and Trauma and missed The Ethics of Storytelling. I’m really hoping we get a write up of the both workshops, especially the latter one, because there are some ethical questions that have been nagging me about historicizing violence for subjects who are still alive. In the concluding plenary seminar we discussed next steps for scholars interested in trauma and healing. The conveners asked me to sit on the panel and so I shared my experiences with working within but still pushing against the boundaries of historical research. Because a lot of my history colleagues had received pushback from people within the discipline about their efforts to historicize trauma, I shared arguments made by people like Nell Irvin Painter (in “Soul Murder and Slavery”) that “since historians cannot bring our historical subjects to the psychologist’s couch” or ask them all the questions we want to ask, we can use some social scientists’ research from investigating the effects of atrocities on living subjects to gain better understandings of how our subjects might have experienced cataclysmic events. I also shared the usefulness of work by Veena Das, Arthur Kleinman, Nancy Scheper-Hughes, and Linda Green for understanding the ways people live in the wake of human atrocities. The plenary was well attended. Aside from a few derailing questions or comments, we had a great discussion. But it was clear that after three days we were all exhausted. For the workshop on Historians and Trauma, there was a lot of discussion about healing (which was a theme of the conference and a thread that ran through many of the sessions), which made me ask historians in attendance, “what does healing look like in the archive?” This is a question I’ve had for some time because whenever I present my work, I inevitably get questions about healing. In attending other people’s presentations on racial violence, I see scholars rush past the horrors toward healing, without presenting evidence that that’s what happened or being transparent about how they’re navigating the archive to reach those conclusions and why. From the reaction, I could tell my question was unexpected but I hope it gave us something to think about. I know archives are constructed. And yes, I’m open to alternative archives. However, I think that when it comes to healing scholars interested in historicizing trauma need to have some discussions what we’re doing, how, and why. These discussions are essential for addressing valid critiques of this field of inquiry. I believe that some survivors of racial violence probably healed (and that “healing” is a construct that merits analysis) but others lived with gaping wounds in their minds, bodies, and souls. Some of them might have gone on to hurt themselves or others. I also know that healing is a complex process that can take years, if it is to occur at all. I’m privileged in having bits of narrative evidence for understanding how African Americans experienced racial violence. Many of my subjects entered the historical record when they reported or narrated their victimization, which was shortly after the wounding event. Then they disappear from many records. The timing of their testimonies was probably too soon for healing to have occurred. What is more, depending on the context of the record’s production, neither the survivor nor person interviewing them used any of the language associated with healing from traumatic injury, which as Anne Rothe points out in her work on “popular trauma culture,” is a late 20th/early 20th century phenomenon. This periodization of “healing’s” entrance into the lexicon is supported by much of the social science lit. So, I asked and ask, what does healing look like in the archive? And what should we do if it’s not indicated? With all that said, making connections with people who get my efforts to understand African Americans’ suffering from post-Civil War atrocities was extremely rewarding. No one there needed an explanation of what I am trying to do or why. They understood and were committed to helping me do it. I’m looking forward to seeing the work produced as a result of this conference.